2) Years collaging? I started 5 years ago with collaging. At this time I couldn´t draw any more because of pain in the wrist. 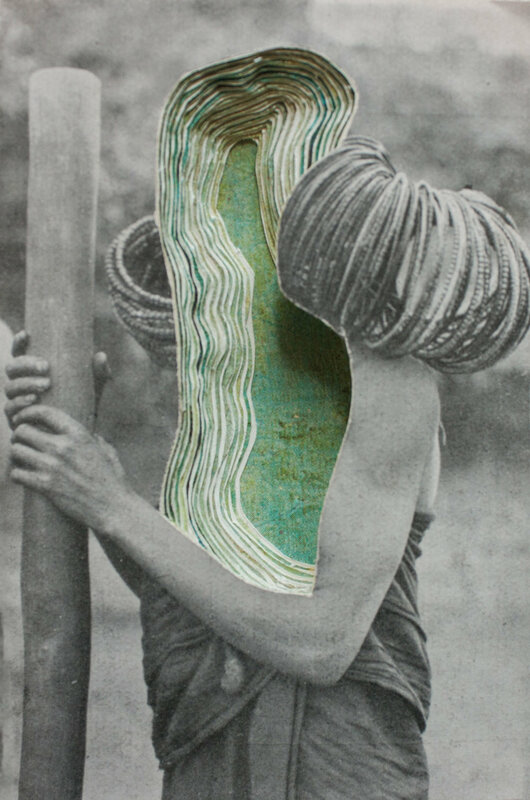 Collaging was like an enlightenment for me. I did not stop working on collages and collage sculptures since then. 3) What do you love and hate about collage? I love the limited possibilities of prefabricated material and the challenge of finding a new and unique artwork. When I am working highly concentrated I sometimes get lost inside the layers and shapes of my collages. It is a very meditative way of working. Sometimes I find a book with fascinating photos and paintings and I can´t use it for collages because it´s too expensive or not for sale. In this moment the strong urge to make a new work of art from it remains unsatisfied. I hate this. 4) Biggest influences? Recently the installations of Liz Magor have been a great inspiration for me. I am also fascinated by the complex and loud collages of Ashkan Honarvar and by the powerful but much more silent collages of John Stezacker. I love mysterious and complex stories and some years ago I fell in love with the books of Haruki Murakami. It is like finding new places in my mind where I have never been before and without the help of the story, I can´t find the way back to these hidden places. Another great inspiration is the (badly done) work of people who stick large-scale placards on walls. I love to watch the destroyed faces, cracks, colorful layers and glue bubbles. They are spontaneous collages created by accident carelessness. 5) Analog Vs Digital? Always analog. I think with my hands. 6) How do you spend your downtime? Making more art. Collecting books and objects for my collages and installations. Playing with dogs. Exploring the nature. Deep Breathing Meditation. 1. Experiments are the best artworks. 2. Move around your city on your bike and watch out for the oldest and best hidden antiquarian bookshops and thrift shops. They have the best books and materials. 3. Watch your health. Don´t use glue containing solvents, because it will damage your lungs and brain. At least use a respiratory mask. I always use double-sided adhesive tape. Takes longer, is more expensive but I will stay safe. 8) Up and coming shows or projects we should know about? I had a collage show at Raum linksrechts in Hamburg in the end of October and another exhibition at Edel Extra in Nuremberg at the beginning of 2018. And I am working on a project with assemblages and Readymades at the moment.